This week’s book review is one that I’ve recommended to family and friends who want to get start with the finances, but don’t have much time. 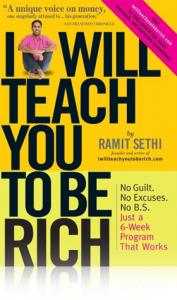 Ramit has been writing for years at I Will Teach You to Be Rich. Before I start getting into the book, I highly recommend that you check out Ramit’s site if you haven’t already. I Will Teach You to Be Rich is kind of a jump start book that allows readers to tackle their finances in 6 weeks. You’ll get a great overview of common financial problems and the steps on how to fix them. He goes topic by topic with finances and I’m sure you’ll find something that you can use in the book. Each chapter introduces ways to improve your finances and then focus on tactical tips on how to execute them. For example, with optimizing credit cards Ramit has scripts you can use to lower your interest rates on your credit cards. If you’re wondering if rate chasing banks is the way to go, Ramit does a wonderful job explaining how you can better utilize your time and your money. I think his biggest chapter is how to create a spending plan. Too many people back way from personal finance because they are afraid of budgets, worried about having to track every penny, and hearing about what they can and can’t do. Ramit has a great system that allows you to automate your finances while including money to spend on the thing you enjoy. It’s not a cure all, but he has a great way of framing it to get you on board. I’m a big fan of Ramit’s writing and this book has some of his best advice and financial systems. If you’re looking to make a big impact on your finances, this is a great book to consider. Ramit shows you step by step what you need to do to get your financial house in order.